For other uses, see Some Like It Hot (disambiguation). Some Like It Hot is a 1959 American romantic comedy film set in 1929, directed and produced by Billy Wilder, starring Marilyn Monroe, Tony Curtis, and Jack Lemmon. The supporting cast includes George Raft, Pat O'Brien, Joe E. Brown, Joan Shawlee, and Nehemiah Persoff. The plot is based on a screenplay by Billy Wilder and Michael Logan from the French film Fanfare of Love. The film is about two musicians who dress in drag in order to escape from mafia gangsters whom they witnessed commit the Saint Valentine's Day Massacre. The film was produced in black and white, even though color films were increasing in popularity. Some Like It Hot is considered to be one of the greatest film comedies of all time. It was voted as the top comedy film by the American Film Institute on their list on AFI's 100 Years... 100 Laughs poll in 2000. The film is also notable for featuring cross dressing, and for playing with the idea of homosexuality, which led to it being produced without approval from the Motion Picture Production Code. The code had been gradually weakening in its scope during the early 1950s, due to increasing social tolerance for previously taboo topics in film, but it was still officially enforced. The overwhelming success of Some Like It Hot was a final nail in the coffin for the Hays Code. It is February 1929 in the city of Chicago, during the era of prohibition. Joe (Tony Curtis) is an irresponsible jazz saxophone player, gambler and ladies' man; his friend Jerry (Jack Lemmon) is a sensible jazz double-bass player; both are working in a speakeasy (disguised as a funeral home) owned by mob gangster "Spats" Colombo (George Raft). When the joint is raided by the police after being tipped off by informant "Toothpick" Charlie (George E. Stone), Joe and Jerry flee—only to accidentally witness Spats and his henchmen exacting his revenge on "Toothpick" and his own gang (inspired by the real-life Saint Valentine's Day Massacre). Penniless and in a mad rush to get out of town, the two musicians take a job with Sweet Sue (Joan Shawlee) and her Society Syncopators, an all-female band headed to Miami. Disguised as women and renaming themselves Josephine and Daphne, they board a train with the band and their male manager, Bienstock. Before they board the train, Joe and Jerry notice Sugar Kane (Marilyn Monroe), the band's vocalist and ukulele player. Joe and Jerry become enamored of Sugar and compete for her affection while maintaining their disguises. Sugar confides that she has sworn off male saxophone players, who have stolen her heart in the past and left her with "the fuzzy end of the lollipop". She has set her sights on finding a sweet, bespectacled millionaire in Florida. During the forbidden drinking and partying on the train, Josephine and Daphne become intimate friends with Sugar, and have to struggle to remember that they are supposed to be girls and cannot make a pass at her. Once in Miami, Joe woos Sugar by assuming a second disguise as a millionaire named Junior, the heir to Shell Oil, while feigning disinterest in Sugar. An actual millionaire, the much-married aging mama's boy Osgood Fielding III, (Joe E. Brown) tries repeatedly to pick up Daphne, who rebuffs him. Osgood invites Daphne for a champagne supper on his yacht. Joe convinces Daphne to keep Osgood occupied onshore so that Junior can take Sugar to Osgood's yacht, passing it off as his. Once on the yacht, Junior explains to Sugar that, due to psychological trauma, he is impotent and frigid, but that he would marry anyone who could change that. Sugar tries to arouse some sexual response in Junior, and begins to succeed. Meanwhile, Daphne and Osgood dance the tango ("La Cumparsita") till dawn. When Joe and Jerry get back to the hotel, Jerry explains that Osgood has proposed marriage to Daphne and that he, as Daphne, has accepted, anticipating an instant divorce and huge cash settlement when his ruse is revealed. Joe convinces Jerry that he cannot actually marry Osgood. The hotel hosts a conference for "Friends of Italian Opera", which is in fact a front for a major meeting of various branches of La Cosa Nostra. Spats and his gang from Chicago recognize Joe and Jerry as the witnesses to the Valentine's Day murders. Joe and Jerry, fearing for their lives, realize they must quit the band and leave the hotel. Joe breaks Sugar's heart by telling her that he, Junior, has to marry a woman of his father's choosing and move to Venezuela. After several chases, Joe and Jerry witness additional mob killings, this time of Spats and his boys. Joe, dressed as Josephine, sees Sugar onstage singing that she will never love again. He kisses her before he leaves, and Sugar realizes that Joe is both Josephine and Junior. Sugar runs from the stage at the end of her performance and manages to jump into the launch from Osgood's yacht New Caledonia just as it is leaving the dock with Joe, Jerry, and Osgood. Joe tells Sugar that he is not good enough for her, that she would be getting the "fuzzy end of the lollipop" yet again, but Sugar wants him anyway. Jerry, for his part, comes up with a list of reasons why he and Osgood cannot get married, ranging from a smoking habit to infertility. Osgood dismisses them all; he loves Daphne and is determined to go through with the marriage. Exasperated, Jerry removes his wig and shouts, "I'm a man!" Osgood simply responds, "Well, nobody's perfect." Joan Shawlee as Sweet Sue, the bandleader of "Sweet Sue and Her Society Syncopators"
Dave Barry as Mister Beinstock, the band manager for "Sweet Sue and Her Society Syncopators"
"Sweet Sue, Just You" — In the score after "I Wanna Be Loved By You"
Billy Wilder wrote the script for the film Some Like it Hot. The plot is based on a screenplay by Robert Thoeren and Michael Logan from the 1936 French film Fanfare of Love. However, the original script for Fanfare of Love was untraceable, so Walter Mirisch found a copy of the German remake Fanfaren der Liebe. He bought the rights to the script and Wilder worked with this to produce a new story. Some Like It Hot is often seen as a remake of Fanfare of Love, as both films follow the story of two musicians in search of work. The studio hired Barbette, a famous female impersonator, to coach Lemmon and Curtis on gender illusion for the film. Marilyn Monroe worked for 10% of the gross in excess of $4 million, Tony Curtis for 5% of the gross over $2 million and Billy Wilder 17.5% of the first million after break-even and 20% thereafter. Tony Curtis was spotted by Billy Wilder while he was making the film Houdini (1953), as he thought Tony would be perfect for the role of Joe. "I was sure Tony was right for it," explained Wilder, "because he was quite handsome, and when he tells Marilyn that he is one of the Shell Oil family, she has to be able to believe it". Wilder's first idea for the role of Jerry was Frank Sinatra, but he never came to the audition. Jerry Lewis and Danny Kaye were also considered for the role of Joe. Finally, Wilder saw Jack Lemmon in the comedy Operation Mad Ball and selected him for the role of Jerry. Billy Wilder and Jack Lemmon made numerous films together until 1981, among them The Apartment and some films with Walter Matthau. According to York Film Notes, Billy Wilder and I.A.L. Diamond didn't expect such a big star as Marilyn Monroe to take the part of Sugar in fact, Wilder said, "Mitzi Gaynor was who we had in mind. The word came that Marilyn wanted the part and then we had to have Marilyn." Wilder and Monroe had already made the film The Seven Year Itch together in 1955. The film was made in California during the summer and autumn of 1958. 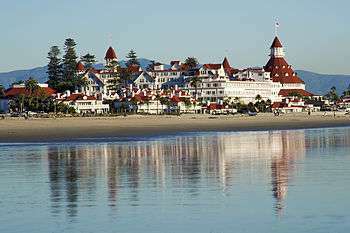 Many scenes were shot at the Hotel del Coronado in San Diego which appeared as the "Seminole Ritz Hotel" in Miami in the film. The Hotel in San Diego fitted into the era of the 1920s and was near Hollywood, so Wilder chose it although it was not in Florida. There were many problems with Marilyn Monroe, who lacked concentration and suffered from addiction to pills. She could not memorize many of her lines and required 47 takes to get "It's me, Sugar" correct, instead saying either "Sugar, it's me" or "It's Sugar, me". Tony Curtis and Jack Lemmon made bets during the filming how many takes Marilyn would need to get it right. For the scene with Shell Jr. and Sugar at the beach three days for shooting were scheduled. Although Marilyn had plenty of complicated lines, the whole scene between Shell Jr. and Sugar was completely finished in only 20 minutes. Monroe's acting coach Paula Strasberg and Monroe's husband Arthur Miller both tried to influence the production, which Wilder and other crew members found annoying. Billy Wilder said in 1959 about filming another movie with Marilyn Monroe: "I have discussed this with my doctor and my psychiatrist and they tell me I'm too old and too rich to go through this again." But Wilder also admitted: "My Aunt Minnie would always be punctual and never hold up production, but who would pay to see my Aunt Minnie?" He also stated that Monroe played her part wonderfully. The film's iconic closing line, "Nobody's perfect"—now ranked 78th on The Hollywood Reporter list of Hollywood's 100 Favorite Movie Lines—was never supposed to be in the final cut. Diamond and Wilder put it in the script as a "placeholder" until they could come up with something better, but never did. With regards to sound design, there is a 'strong musical element' in the film, with the soundtrack created by Adolph Deutsch. It has an authentic 1920s jazz feel using sharp, brassy strings to create tension in certain moments, for example whenever Spats' gangsters appear. In terms of cinematography and aesthetics, Billy Wilder chose to shoot the film in black and white as Jack Lemmon and Tony Curtis in full drag costume and make-up looked 'unacceptably grotesque' in early color tests. Some Like it Hot received widespread critical acclaim, and received six Academy Award nominations, including Best Actor for Lemmon and Best Director and Best Screenplay for Wilder, the latter along with I.A.L. Diamond. It was voted as the top comedy film by the American Film Institute on their list on AFI's 100 Years... 100 Laughs poll in 2000. By 1962, the film had grossed $14 million in the US. Roger Ebert wrote about the movie, "Wilder's 1959 comedy is one of the enduring treasures of the movies, a film of inspiration and meticulous craft." John McCarten of The New Yorker referred to the film as "a jolly, carefree enterprise". The Guardian's Richard Roud claims that Wilder comes "close to perfection" with the film. Rotten Tomatoes reports a score of 96%, with an average score of 8.9 out of 10. In 1989 this film became one of the first 25 inducted into the United States National Film Registry. Despite critical accolades, at the time of release it was the only American film to receive a "C" or Condemned rating by the Roman Catholic Church's Legion of Decency. An unsold television pilot was filmed by Mirisch Productions in 1961 featuring Vic Damone and Tina Louise. As a favor to the production company, Jack Lemmon and Tony Curtis agreed to film cameo appearances, returning as their original characters, Daphne and Josephine, at the beginning of the pilot. Their appearance sees them in a hospital where Jerry (Lemmon) is being treated for his impacted back tooth and Joe (Curtis) is the same O blood type. In 1972, a musical play based on the screenplay of the film, entitled Sugar, opened on Broadway, and starred Elaine Joyce, Robert Morse, Tony Roberts and Cyril Ritchard, with book by Peter Stone, lyrics by Bob Merrill, and (all-new) music by Jule Styne. A 1991 stage production of this show in London featured Tommy Steele and retained the film's title. In 2002, the ageing Tony Curtis performed in a stage production of the film, cast as the character originally played by Joe E. Brown (Osgood Fielding III). ↑ "Remembering Hollywood's Hays Code, 40 Years On". NPR.org. 8 August 2008. Retrieved 14 March 2016. ↑ "There's No Business Like Show Business (1954): Soundtracks". IMDb. Retrieved November 7, 2014. ↑ rich-826 (2 July 1953). "Houdini (1953)". IMDb. Retrieved 14 March 2016. ↑ Alison Castle (Hrsg. ): Billy Wilder’s Some like it hot. Taschen, 2001, p. 24. ↑ Alison Castle (Hrsg. ): Billy Wilder’s Some like it hot. Taschen, 2001, S. 238. ↑ Volker Schlöndorff: Billy Wilder in Billy Wilder speaks. Some like it hot. DVD, Oktober 2006. ↑ "The Making of Some Like It Hot". google.de. Retrieved 14 March 2016. ↑ "Great Funny Quotes: Sweeten Your Life with Laughter". google.de. Retrieved 14 March 2016. ↑ Alison Castle (Hrsg. ): Billy Wilder’s Some like it hot. Taschen, 2001, S. 287. ↑ Hollywood's 100 Favorite Movie Lines. The Hollywood Reporter, March 11–18, 2016, No. 9, p. 69. ↑ "American Film Institute". afi.com. Retrieved 14 March 2016. ↑ Roger Ebert (9 January 2000). "Some Like It Hot". rogerebert.com. Retrieved 14 March 2016. ↑ Mccarten, John (1959). "The Current Cinema". The New Yorker. ↑ Roud, Richard (1967). "Review". The Guardian. ↑ "Some Like It Hot". rottentomatoes.com. 29 March 1959. Retrieved 14 March 2016. ↑ Phillips, Gene. Some Like it Wilder. University of Kentucky Press. p. 223. ↑ "Venice Film Festival: Awards for 1959". IMDb. Retrieved November 23, 2014. ↑ "Directors Guild of America, USA: Awards for 1960". IMDb. Retrieved November 23, 2014. ↑ "National Board of Review: 1959 Award Winners". nationalboardofreview.org. Retrieved November 23, 2014. ↑ "National Board of Review, USA: Awards for 1959". IMDb. Retrieved November 23, 2014. ↑ "12th Annual DGA Awards: Honoring Outstanding Directorial Achievement For 1959". dga.org. Retrieved November 23, 2014. ↑ "BAFTA Awards Search: 1960". bafta.org. Retrieved November 23, 2014. ↑ "The 17th Annual Golden Globe Awards (1960)". hfpa.org. Retrieved November 23, 2014. ↑ "The 32nd Academy Awards - 1960: Winners & Nominees". oscars.org. Retrieved November 23, 2014. ↑ "Writers Guild of America, USA: Awards for 1960". IMDb. Retrieved November 23, 2014. ↑ "1960 Awards Winners". wga.org. Retrieved November 23, 2014. 1 2 "Laurel Awards: Awards for 1960". IMDb. Retrieved November 23, 2014. ↑ "The BAMBI award goes to…: A selection of international BAMBI award winners since 1948". bambi-awards.com. Retrieved November 23, 2014. ↑ "AFI's 100 Years...100 Movies" (PDF). American Film Institute. Retrieved August 27, 2016. ↑ "AFI's 100 Years...100 Laughs" (PDF). American Film Institute. Retrieved August 27, 2016. ↑ "AFI's 100 Years...100 Movie Quotes" (PDF). American Film Institute. Retrieved August 27, 2016. ↑ "AFI's 100 Years...100 Movies (10th Anniversary Edition)" (PDF). American Film Institute. Retrieved August 27, 2016. 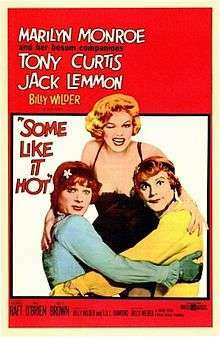 ↑ "Some Like It Hot [Tv Pilot] (1961)". BFI. Retrieved 14 March 2016. Curtis, Tony. The Making of Some Like It Hot, Wiley & Sons, Hoboken NJ, 2009. ISBN 978-0-470-53721-3. Maslon, Laurence. Some Like It Hot: The Official 50th Anniversary Companion, New York, HarperCollins, 2009. ISBN 978-0-06-176123-2. Wikimedia Commons has media related to Some Like It Hot (1959 film).